Sight and hearing loss are both more common as you get older. For a person with dementia, sight or hearing loss (or both ) can cause extra problems. It can make the person more confused about what is happening around them, and it can cause problems with communication. It is often hard to separate the signs of hearing loss from those of dementia, and often one condition may mask the other. For example, struggling to follow a conversation could be a symptom of either dementia or hearing loss. It’s important for people with dementia to have regular hearing tests. The starting point is to speak to their GP. Both dementia and hearing loss can have an impact on how someone copes day to day – for example, making it harder to communicate. They can also both lead to increased social isolation, loss of independence, and problems with everyday activities, and as a result, make the person’s dementia seem worse. Having regular hearing checks and making the most of the hearing the person does have – for example, by using hearing aids. Improving the environment, for example by reducing background noise and distractions and making sure the area is well lit. Using gestures and expressions, and letting people see your face when communicating. 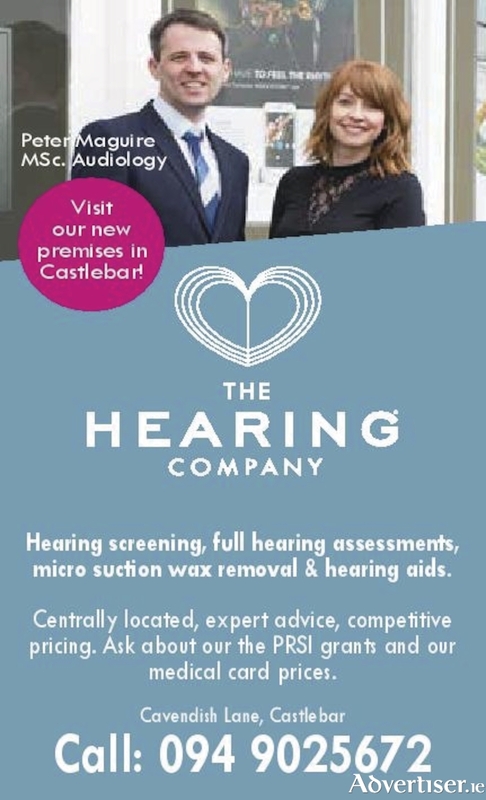 Come and support us on the 18th May at The Hearing Company, Cavendish Lane, Castlebar for our Alzheimer's Tea Day.